What should be included in a Wireless Network Design? Planning is the most significant step in any wireless network design, particularly for new technology initiatives such as implementing the use of iPads, allowing BYOD, or the myriad of other mobile device projects your wireless network has to support. But wireless network design in today’s standards is different than in years past…and you can be certain it’s going to continue to evolve over the next few years. So before you purchase a wireless solution, you should have a professional design your wireless network for what’s coming. So as you can see from these astonishing predictions, deploying a WLAN solution successfully is more than just putting in a bunch of access points and hoping they work. You need to engage with an IT solutions provider that can work with your team to determine the best combination of coverage and capacity to ensure the best performance for your applications. Of course, at SecurEdge, we do this for a living. So if you want to talk to one of our consultants, you can register for a free assessment here. A complete wireless network system analysis. You need to have an industry solution expert that can understand your existing needs, offer suggestions for the future and what you should be preparing for, as well as provide a comprehensive analysis of your current environment. A predictive site survey is a virtual survey of your site or facility that uses pertinent information about the site to plan the wireless network. While predictive wireless design tools are very effective at planning a wireless system, in some cases an onsite survey is required. Either way, one of these should be done for an accurate and complete wireless network design. 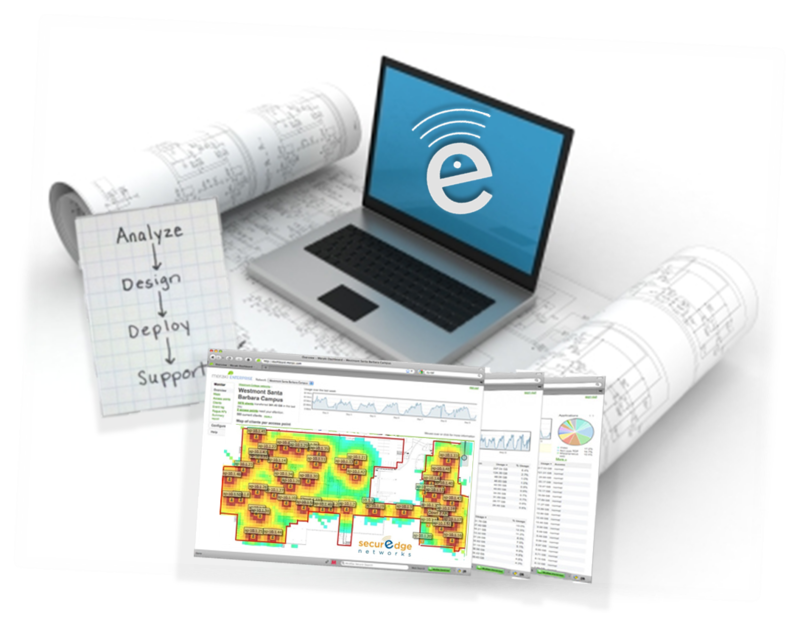 After determining the scope of the project through thorough analysis and completing a site survey, you should receive an RF plan as part of your wireless network design. The RF plan should show the predictive coverage for your buildings. The plan should show both the speeds of the anticipated connection as well as a “heat map” to show you signal to noise ratio. It’s not just about coverage area anymore; it’s about how many devices you can support and the type. That’s capacity planning. Ask your vendor how many total devices your system can handle, and watch out for potential problem areas like conference rooms or large meeting halls where you know capacity would be a big concern. Wireless security for someone bringing their personal iPad (BYOD) to the office should be treated differently than someone using a corporate issued thinkpad. Your wireless provider should map out how you’re going to support the security “Roles” around the different groups of users and devices. We call this Role Based Access Control. Here’s where the design turns into an executable project. You’ll need a bill of materials for what’s included in the project, total project pricing, and a timeline for execution. Remember planning is the most important step for every secure wireless network. So make sure your wireless network design at the very least includes these things. You don’t want to your newly installed wireless network to be obsolete because of poor planning. SecurEdge Networks has years of experience working with many different types of industries to build large scale wireless systems. We have designed and installed systems that support thousands of users and mobile devices. If you have any questions about wireless network design feel free to contact us here. Our goal is to be a resource for you!